You know when it just 'happens', and you find one that just fits, works and sounds like the 'sound in your head' ? Anyway, I had an inkling that a Gibson would be for me, as most of my 'heroes' I grew up with played them, and the records I heard were full of those things. Then, the guy handed me the Atkin. Now I don't know much about them, although some of you had recommended them to me. It was light years ahead of the Gibsons, in every way. It was bang in tune, had a louder and more sweeter, musical throw; was a great strummer, and a lovely finger picker. The action was perfect. And it has a gorgeous aged relic feel to it. I haven't got to worry about bangs and scrapes, and it is already 'worn in'. Needless to say, it came home with me (Website photos below). This model is originally based on the Buddy Holly 1943 model. 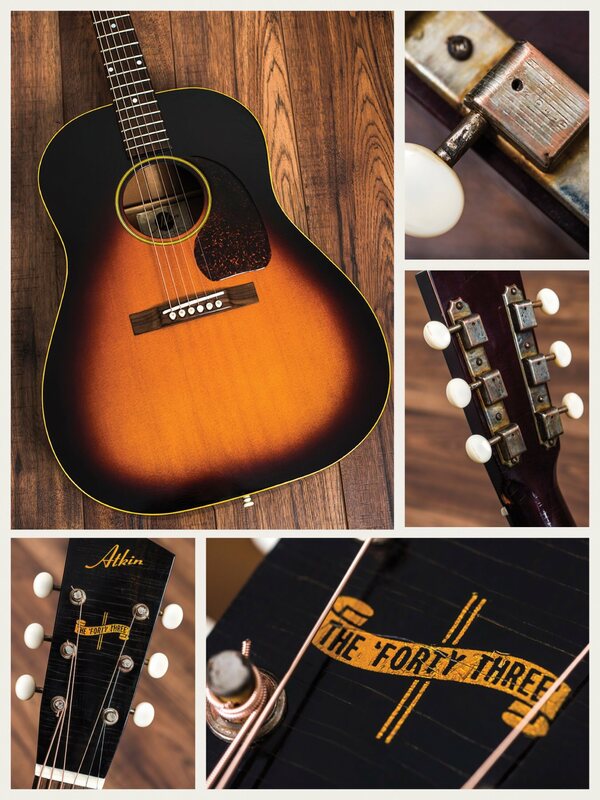 "The Forty Three pays homage to the legendary banner-era J-45, a classic design that has inspired us both as players and guitar makers. After working with the Buddy Holly Guitar Foundation to recreate Buddy’s 1943 J-45, we decided to permanently add this exacting replica to our range. 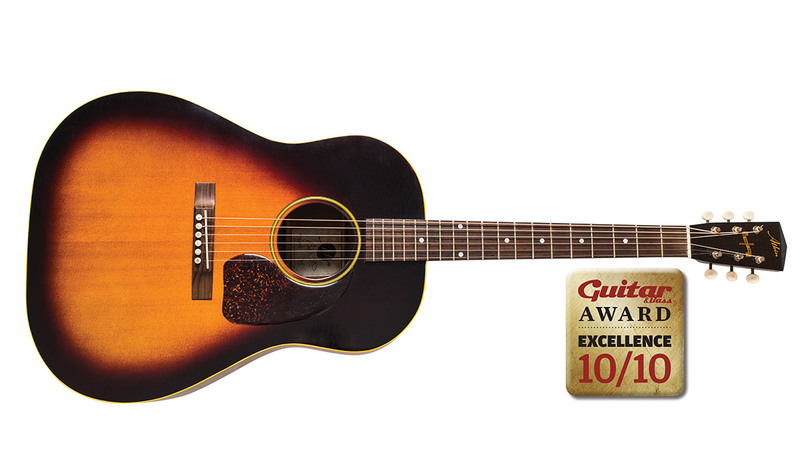 Direct and powerful, but with an easy-playing shorter scale length, it’s easy to see why this guitar has been favoured by so many singer-songwriters over the years. The big-bodied J-45 shape, combined with a Sitka spruce top and mahogany back and sides, delivers warm mids, solid lows and great definition. It’s a timeless acoustic guitar tone." Congrats! Those 43s are superb. Alister's guitars are exceptional. Enjoy! Pretty much heaven right there. That is one hell of a guitar. Lovely. The Buddy Holly connection would have drawn me to it, I must admit, and it looks gorgeous. GAS attack strikes yet-a-bloody-again. Gorgeous. I had an Atkin OM and foolishly let it go. One day I will own another of Alistair's guitars. Beautiful! That headstock shape is so cool! Briefly tried one at the show at Olympia today. Lot of background noise but it did seem very good. Firstly, I havent even needed to tune the Atkin yet... impressive. But man alive, I kept going back to this lovely Atkin. I just could not put it down. Very light in weight, gorgeous (and I mean gorgeous) smell, lovely vintage case, great lacquer checking, subtle relicing, worn in feel. And, I really mean this, the best acoustic sound Ive heard. Wow. Really cool. Ever since I've taken the decision to drastically reduce the electric guitars I own. I've been playing acoustic more and more. I've been reading up on Atkin and Brook guitars. I need to find a store where I can go in and try some models of both. In particular to me the Atkin 0037 and 037 are really appealing. I remember when that came in for review. Unreal. Let me know as I may have missed that copy, as I was on me hols last June, and Id like a hard copy. Wow, your review echoes my own findings. Have you guys had the opportunity of playing a Brook acoustic? I'm probably going to try some this week, as well as some Atkins. I played the 43 at the guitar show. It was too loud at the event to really hear in any detail but it felt and looked lovely. The Atkin guys were very friendly to. I could see myself ordering from them I the future. I should have a copy somewhere if you want it. I played a few at Coda and I thought they were much better than the Gibsons. What pick ups are you using ? The Forty-Three looks brilliant. Serious congrats. Had a short play on a forty-three yesterday. Sounded great, balanced, not muddy or bright. Louder than I was expecting too. I was really looking forward to seeing the ageing up close but was a bit disappointed with the one I tried in that the 'checking' went in funny concentric circles and just didn't look realistic. Looked like a pool of solvent had been put on the top and allowed to evaporate. Other than that it looked and felt great though. Not sure how different one is to another in the ageing aspect? Two weeks or so into ownership, and it remains the best, most fun and beautiful acoustic I've ever played ! I recently bought an Atkin off a friend... I'd been fancying a J-45 for years and he had this one for sale. It's a custom build, so basically a J-45 shape but not quite the same. It seems to be the guitar I've been looking for (for a very long time), and nearly a year on I'm still amazingly happy with it. So much so, in fact, that I've decided to sell just about all my other acoustics, because there's no point having a bunch of guitars around that aren't getting played!